Cookies, Cookies, Cookies! – What's for Dinner Moms? Have all your baking done? We bake right up until Christmas Eve when we finish with making Grandma’s Apple Kuchens. 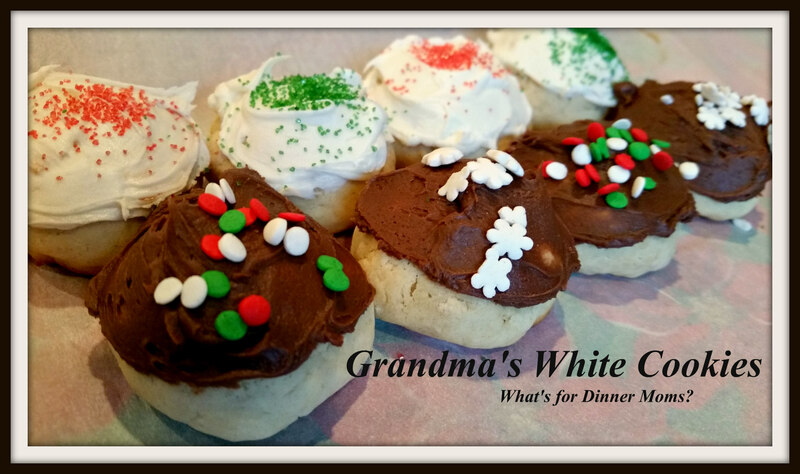 If you wish tell me about your favorite holiday cookies or a link to a favorite on your blog! Can’t wait to see all the cookies I need to try! 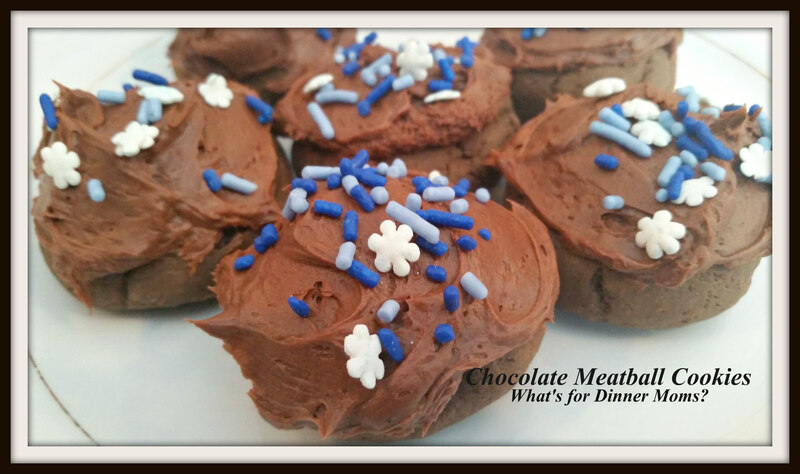 These Chocolate Meatball Cookies (click for link to recipe) are my favorite! A bit savory more than sweet with a hint of cloves and cinnamon. Ah family memories! These cookies are super simple and always look so festive! Kids can help you roll the cookies in the sprinkles. 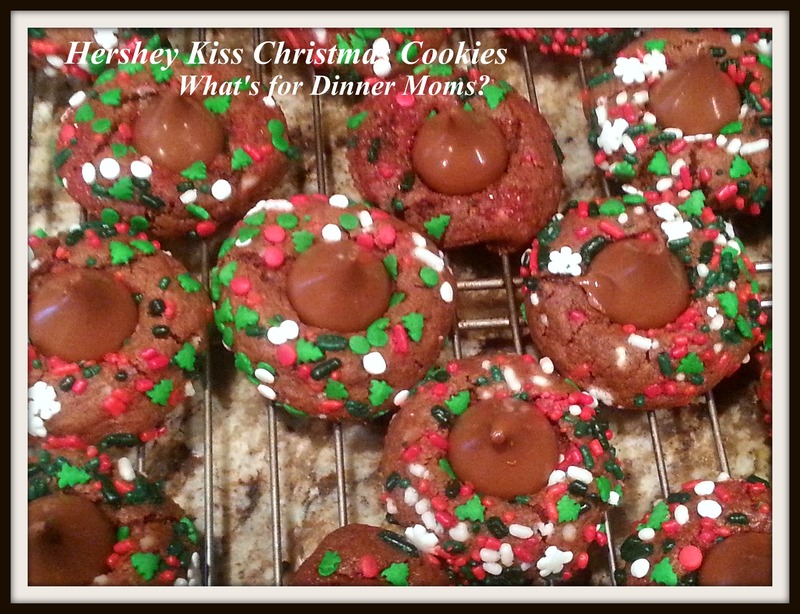 These Hershey Kiss Cookies (click for link to recipe) can be a fun addition to your usual cookies. So, there are a few of our favorite cookies. What are yours? Have recipe or link to your favorite? Place it below in the comments. I may even add a few batches to my usual cookies. I just finished making Mocha Madeleines and I have to take a pic to post. I have a pile of cookbook open right now picking out others to make from what I have on hand. I get up early and make a batch of cookies each day. I just have to catch up on my posting. Those chocolate cookies look yummy and thanks for sharing. Yum! Cannot wait to see the pictures! Your kiss cookies are too cute! Thank you for these yummy recipes. I just spent the other day baking all day, I made over two hundred cookies and I am still not done. In our family we pass out cookies to neighbors and friends everywhere, this is a favorite tradition of ours. We also drop off cookies to a little church down the street that does a live nativity for members and people in our neighborhood. Afterwards they pass out hot cocoa and cookies to everyone, so they always ask for cookie donations this time of year. I do love Christmas and all it’s yummy treats, thanks again for sharing some of yours with us. What a great tradition! We pass out Kuchen to our neighbors on Christmas Eve morning. We drive around to friends and neighbors as my grandparent’s did using the same recipe. I love family traditions like this! Gosh, they all look amazing! You are not only a creative cook but also a great artist and designer, Marci! That’s the last thing I would think of myself but thank you for seeing that, Erika! You’re welcome and thank you, Marci! Adorable cookies! In our family we obsess over rainbow cookies, nutella chocolate chip, and linzer tarts. The yummiest time of year ! Thank you! I haven’t had Linzer Tarts in ages! Yummy! I believe that Christmas is made for baking!Thanks for sharing! Looks delicious! I could go for some of those right about now.